Batman vs. Two-Face (film, 2017). A 2017 American animated direct-to-video superhero film with "PG" rating by Warner Bros. Home Entertainment/Warner Home Video. Directed by Rick Morales. Official Trailer. 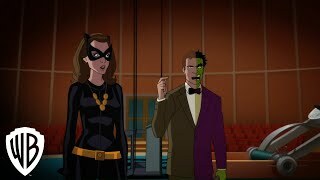 Batman vs. Two-Face is a 2017 American animated direct-to-video superhero film directed by Rick Morales. Batman and Robin are invited to a top-secret demonstration hosted by Professor Hugo Strange and his assistant Dr. Harleen Quinzel that may eventually change the future of Gotham forever. Along the way, Batman takes a stop at Gotham State Penitentiary to visit Catwoman (whose suicide attempt from the first movie somehow failed) to give her a book on poetry by Elizabeth Barrett Browning. This is something to keep her occupied for the next 36 months until she is let out of prison for good. At the laboratory, they meet district attorney and Bruce Wayne's ally in the war against crime Harvey Dent who is famous for having stopped a coin counterfeiting gang while keeping a two-faced quarter as a souvenir from the case. Hugo Strange believes that good and evil are all but one-sided and has created an "Evil Extractor" to which the volunteering criminals Joker, Penguin, Riddler, Egghead, and Mr. Freeze, will be purified of their corruption. Batman bluffs it off, saying that there are no easy fixes to the straight and narrow path, but Strange conducts his experiment anyway, despite the fact that it will make the jobs of Batman, Robin and Harvey obsolete. All goes well until the Joker entices his fellow villains to overload the machine. Noticing this, Professor Strange orders Dr. Quinzel to shut it down...but is too late and Harvey (as opposed to acid from the comic book mythos) is horribly scarred by the explosion of the containment vat, with Batman being successful in saving the right side of his face. The film Batman vs. Two-Face was scheduled to be released by Warner Bros. Home Entertainment and Warner Home Video on October 8, 2017 (New York Comic Con) and on October 10, 2017. The duration of the film is 72 minutes. 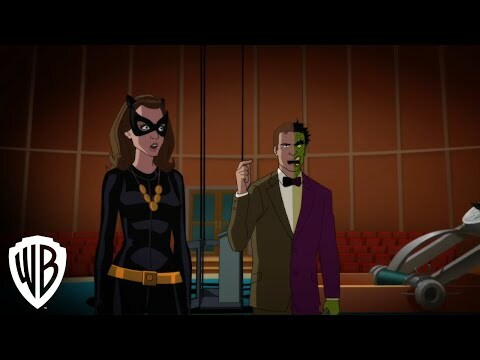 Batman vs. Two-Face got high rating from critics. The audience also likes the film.